Two games. Two blowout wins. Despite a miserable night at the free throw line and finishing with 18 turnovers, UNLV (2-0) still cruised past outmanned Prairie View A&M, 98-63, on Wednesday night at the Thomas & Mack Center. The Runnin’ Rebels, who led 55-41 at halftime, blew the game open with a 22-2 run midway through the second half and led by as many as 39 points against the Panthers (0-3), who finished tied for third in the Southwestern Athletic Conference last year. Five players scored in double figures for UNLV and two – freshman forward Brandon McCoy (15 points, 11 rebounds) and junior college transfer Shakur Juiston (13 points, 12 rebounds) – finished with double-doubles for the second straight game. Point guard Jordan Johnson (16 points, nine assists) just missed another double-double. 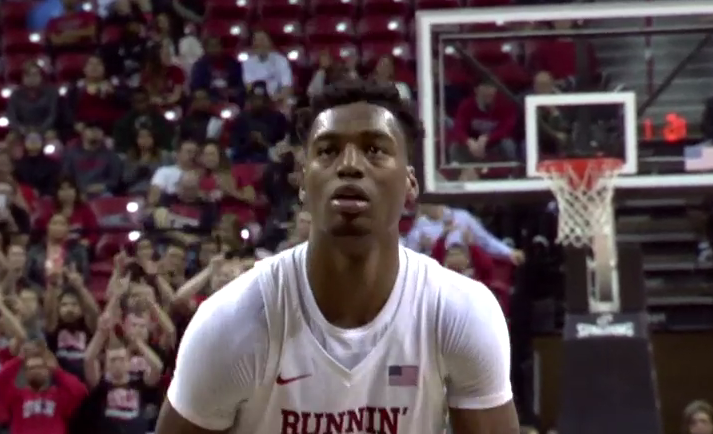 The Runnin’ Rebels used their superior height to once again dominate the paint, finishing with a 55-40 rebounding edge and a 60-24 advantage in points in the paint. One big negative was free throw shooting. UNLV sank just 19-of-38 attempts (50 percent), including 1-of-7 by McDonald’s All-American McCoy. KEY PLAYER: Anthony Smith, a 6-4 junior guard transfer from Feather River College in Quincy, Calif., came off the bench to score a team-high 17 points on 8-of-10 shooting to go along with seven rebounds and two steals. “It’s a lot different story. Last year was really tough to watch.” – UNLV coach Marvin Menzies on his team shooting over 52 percent from the floor for the second straight game. The Runnin’ Rebels shot just 39.5 percent from the floor last season. UP NEXT: The Runnin’ Rebels end a three-game homestand at the Thomas & Mack Center on Friday night when they host Eastern Washington (2-1) at 7 p.m. It’s the third game of a 10-game road trip for the Eagles who ended a 21-game losing streak against Pac-12 competition that dated back to Dec. 14, 2002, when they upset Stanford, 67-61, on Tuesday night. NOTABLE: The Rebels finished with 23-4 edge in fast break points and have a 35-4 edge in that category this season. … Guard Jovan Mooring also scored in double figures (11) and had six assists. … UNLV finished with 12 steals, including a game-high three by Johnson. … Former Rebels and Foothill High star Austin Starr had eight points, including 2-of-6 3-pointers, for Prairie View A&M which shot just 30.9 percent from the field. … The game was part of the preliminary rounds of the MGM Resorts Main Event tournament. The heavyweight rounds will be played at T-Mobile Arena in Las Vegas next week with UNLV playing Rice and Ole Miss meeting Utah on Monday night and the winners and losers facing off on Wednesday.